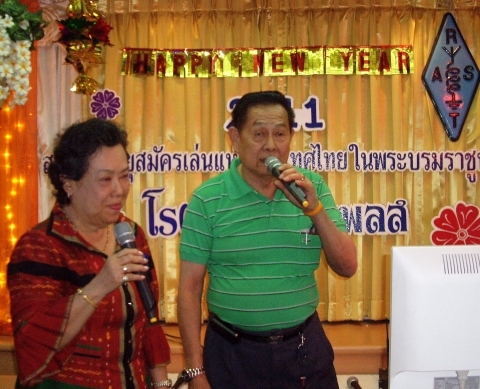 Gen Prasit, HS1DN (right) and Yannee, HS1LCC, take to the microphones on stage for a karaoke session during the New Year party at Sena Place Hotel on January 9, 2011. The RAST New Year party this year was held over lunch at the usual meeting venue at Sena Place Hotel and was well-attended, while there were some new faces to see in the New Year and exchange gifts. Among those attending a RAST gathering for the first time were Andy, 9A3JH, from Croatia and Aki, JA6ECJ/VA2AKI/W6OO, from Montreal, Canada. Aki is also a volunteer examiner and will help Champ with the next US exam in Bangkok to be conducted in February. RAST President Chaiyong, HS1QVD, wished everyone a Happy New Year and made a few brief announcements before inviting Champ to provide a summary of the results of the Volunteer Examiner (VE) examinations conducted early in December (see full results below). 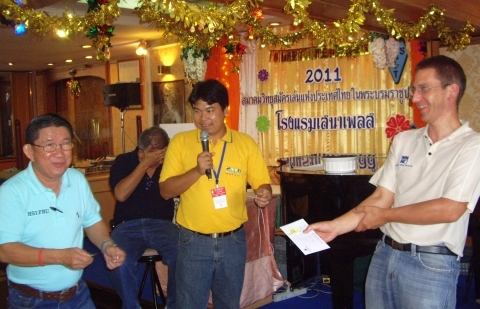 Champ, E21EIC, had organised and led the event while one of the VEs, Akira, JA1NMH/W1NMH, formally presented the sum of over 6,000 baht derived in application fees to Chaiyong, who accepted the donation on behalf of RAST. Champ also presented some QSL cards for the special call E2E that the NTC authorised RAST to use in contests last year, and Khun Chaiyong, in turn, handed these over to Charly, HS0ZCW (pictured below). 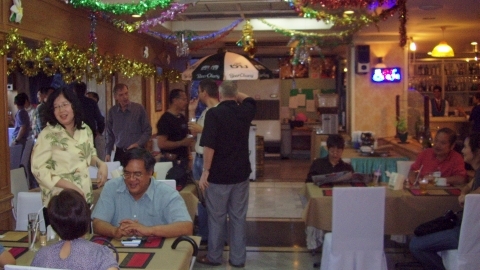 Sponsoring the party was ThaiBev Public Company Limited who provided party-goers with draught Beer Chang, while members also enjoyed a buffet lunch prepared as usual by the Sena Place Hotel kitchen. Members each brought a gift-wrapped New Year's present and everyone bringing a gift drew lots to receive a their gift in exchange. A table loaded down with the gifts can be seen here at right. 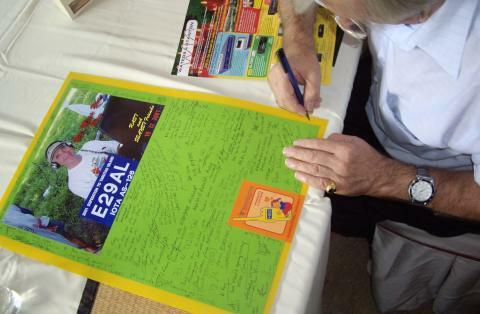 Charly accepts the E2E QSL cards from Chaiyong, HS1QVD, after Champ donated them to RAST. A general view of the New Year Party at Sena Place. From Left: Akira, JA1NMH, a first-time visitor from Montreal, Canada, Aki, JA6ECJ/VA2AKI/W6OO (with his back to the camera), Swen, HS0ZFZ, Winit, HS1CKC and Chris, HS0ZFE. Champ addresses the gathering as Chaiyong looks on. Akira, JA1NMH/W1NMH (left), and Chief VE Co-ordinator Champ, E21EIC, present an envelope to Chaiyong, HS1QVD (right) with proceeds from the VE examination conducted in December. Boungorn Greeno, HS0ZDU/KC0BVH presents her gift to Khun Mayuree Chotikul, HS1YL. Swen, HS0ZFZ and Phitthaya, HS1FRU share a light moment during their NY gift exchange. 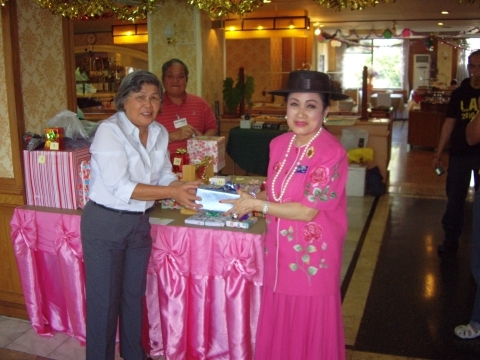 Goi, E20NKB, presents her gift to Khun Wacharaphon, HS4DDQ during the festivities. On the morning of December 18, RAST President Chaiyong and several RAST committee members and advisers joined a merit-making ceremony at the house of Lawan and Ray Gerrard, HS0ZDZ, in Pathum Thani on the occasion of Ray's birthday. They presented posters bearing greetings from delegates attending the Seanet Convention in Shanghai in November as well as messages from many RAST members who had attended the December meeting at Sena Place Hotel. Among those visiting Ray were Chaiyong, HS1QVD, Prasit, HS1DN, Yannee, HS1LCC, Winit, HS1CKC and Thida, HS1ASC. Ray suffered a heart attack while travelling as a passenger in his car in late 2004 to attend a press conference to announce the upcoming Seanet Convention in Bangkok. He was rushed to hospital, where he was revived and he later recovered from a coma. However, he has not fully regained all his faculties and he lives at home where his wife cares for him. There is also a touching YouTube video where delegates attending the Seanet Convention in Shanghai, China in November last year pay tributes to Ray and wish him a speedy recovery. Champ, E21EIC and KY1A, led a team of Volunteer Examiners (VEs) on the weekend of December 11-12, 2010 to administer tests to a total of 34 individuals seeking to obtain a US amateur radio licence. The tests were conducted at Bangkok University and the results are as follows: in all, 23 sat and passed the examinations that were held over two days at Bangkok University, while nine others took the exams and failed while another two who had applied to sit the exams did not show up on the day. Seven of those who passed are now US Extra class licensees, six are General class hams and 10 now hold a Technical class amateur radio licence. May I take this opportunity, on behalf of RAST, to congratulate those who passed. Assisting Champ over the two days of examinations were other volunteer examiners HS0ZFR (NJ2Z), JA1NMH (W1NMH), 9M2CQC (WQ2C), 9M2CCO and HS0ZIU (WS2E). Pictures of the examination room and of many of those who took and passed can be found at Champ's website here . Champ intends to conduct more VE amateur radio examinations this year, beginning later this month at a date to be announced in Vientiane, Laos, on February 26 in Bangkok at Bangkok University (for up to 40 people), in Surat Thani on March 26 for 20 people, in Bangkok during April, June, October and December and also in Chiang Mai on Aug 13, 2011 for 20 people at the HS5AC club station. 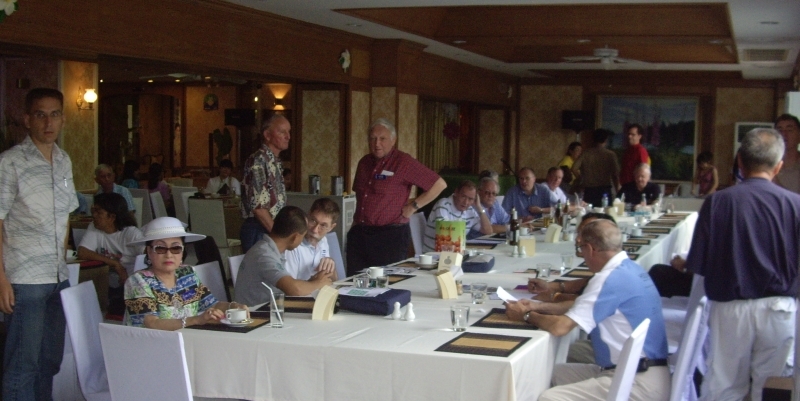 The December RAST meeting at Sena Place Hotel welcomed back some familiar faces and welcomed "world traveller" Peter, DJ8XW, from Munich and two representatives of the Rotarians of Amateur Radio from Japan, Vice Chairman of ROAR Tim Masuda, JH1NVZ, and Yoshio, JE1JQX who were in Bangkok to seek help from RAST to establish a special event station in conjunction with a World Conference of Rotarians to be held in Bangkok in May, 2012. From left: Tony, HS0ZDX, Tim, JH1NVZ and Yoshio, JE1JQX at the Dec 5 RAST meeting. Among the more familiar faces were returnees: RAST life members Lyle Greeno, W4OMK, and his Thai-born XYL, Orn, who were back in Bangkok from Florida; Lyle has been returning here regularly since serving at the US Embassy in Bangkok for four years in 1967. Presiding over the meeting and standing in for RAST President Chaiyong Wonwuticomjon, HS1QVD, was Kanchit Charmaraman, HS1JC, who had also chaired a committee meeting prior to the social gathering when it had been decided that the RAST New Year Party would be held on the second Sunday in January. The party will be held at Sena Place Hotel from 10 a.m. until 3 p.m. on January 9. 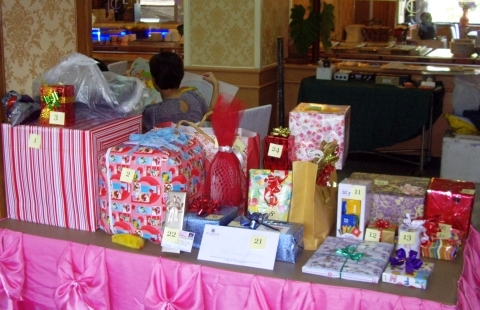 Members were reminded to bring a gift-wrapped present with a value of at least 300 baht that will be exchanged during the party, while an email invitation will be sent out to those on the RAST mailing list. There was also an update on the forthcoming intermediate class amateur radio examination and Kanchit said it was hoped would take place in May next year. RAST had sought permission for this from the NTC and was now awaiting a response, he added. RAST club station HS0AC manager Finn, HS0/OZ1HET, provided an update on activities at the station on the AIT campus which included several visitors to the station on November 9, including Hans, HS0ZBT/HB9DKZ, Renato, HB9BXQ, Chris, HS0ZFE, and Batyr, UN7EY who between them worked stations on both SSB and CW. Then on the weekend of November 28-29 HS0AC's "big event of the year" had been the CQWW CW contest, when a total of 3,173 QSOs were made in a multi-single effort by a team of skilled operators led by Sam, SM3DYU/HS0ZDY. These included Fred, K3ZO/HS0ZAR, Stig, LA7JO/HS0ZGD, Champ, E21EIC, Swen, HS0ZFZ, John, W2YR/HS0ZDJ, Winit, HS1CKC and Finn, OZ1HET. The operators kept the QSOs going for 48 hours for a total score of 4,415,931 points. Much work had been put into the preparations for this contest, with Sam and Stig making several excursions to AIT, erecting additional towers and antennas and the score, while not as high as had been hoped, was considerable given that there were several equipment failures -- both computers and radios -- while propagation had not been as good as had been hoped for. 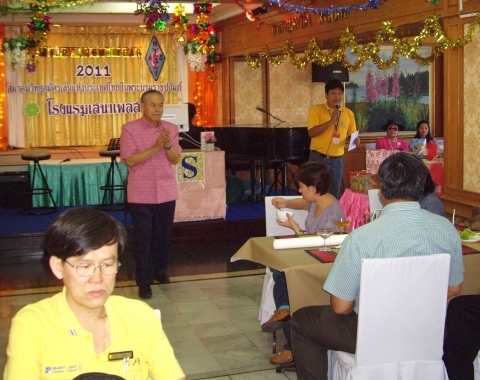 Kanchit also announced that the Saraburi amateur radio association had invited RAST representatives to attend a dinner on December 18, and that RAST President Chaiyong had accepted a table of 10 persons and that any RAST member interested in attending on behalf of the society should contact Chaiyong directly. Finally, although she couldn't be present at the meeting, Thida, HS1ASC, who had attended the recent Seanet convention in Shanghai, China, sent over two large posters with photographs of Ray Gerrard, HS0ZDZ, who has been disabled since a heart attack six years ago, and the late Sawang, HS1BNP, who passed away just over one year ago that had been signed by many well-wishers and friends at the convention. A RAST member adds his name and a message to Ray, HS0ZDZ, during the December meeting. Many RAST members who were unable to attend the SEANET in Shanghai in November added their names to send their best wishes to Ray and to remember Sawang during the December meeting. These posters were to be returned to Thida who is to forward them to Ray's XYL, Lawan, and to the widow of Sawang. A source of the sacred spring water that was used by Palace officials to anoint His Majesty the King when he ascended the throne is located on the mountaintop that overlooks a temple, or sumnuksong, at Doi Khamor Bor Nam Tip in Lamphun. 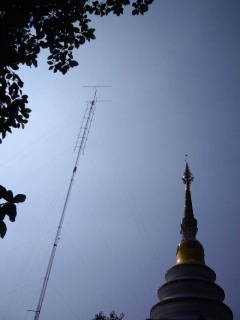 The abbot of this auspicious temple, some 650 kilometres north of Bangkok, is also a licensed radio ham and two 60-metre amateur radio towers dominate the skyline, one of which belongs to the Lamphun Amateur Radio Society club station HS5AL. And, thanks to the wishes of a late former secretary of the Radio Amateur Society of Thailand (RAST) and a decision by the RAST committee led by President Chaiyong Wongwuticomjon, HS1QVD, the newly-constructed club station has two separate operating rooms with one of them now dedicated to HF amateur radio communications. Since the afternoon of Sunday, November 7, 2010, there has been working HF equipment on the desk in this room at the station for its intermediate-class licensed members to use following the formal handover of an HF transceiver and amplifier that had belonged to the late Edward Rose, HS0ZAN. 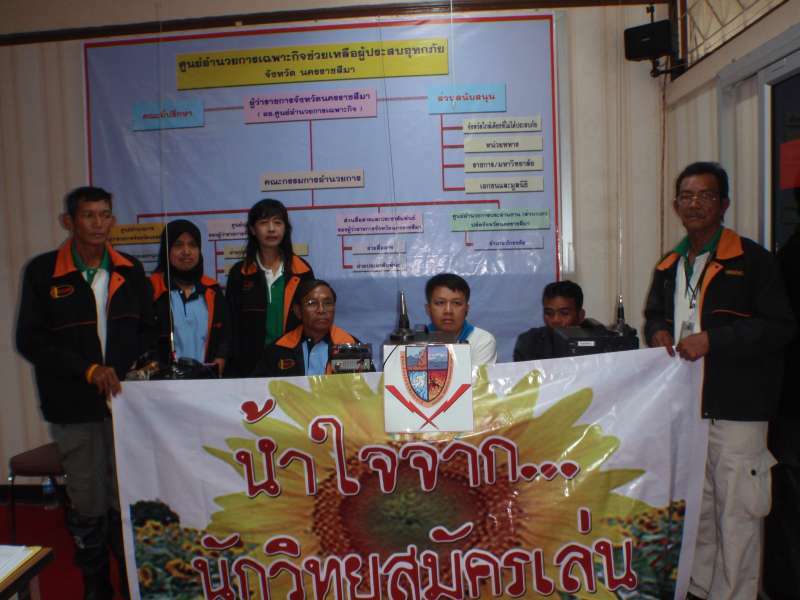 Acting on behalf of RAST, Tony Waltham, HS0ZDX and Malee Rose, Edward's wife, presented the equipment to Khun Wittaya, HS5EXL in a ceremony presided over by the abbot of the temple, Jao Awart Sanguan, who is a novice-class licensed amateur radio operator. The abbot afterwards told me that he realised the importance of HF communications and thus supported its inclusion at HS5AL because he had used such equipment and was familiar with its potential before entering the monkhood when he had served in the Royal Thai Air Force. Before the equipment was handed over, Svante (Sam) Nordenstroem, HS0ZDY, who had travelled up to Lamphun for the event with me, carefully inspected the Yaesu FT101E and microphone as well as the FL2100 linear amplifier, replacing some components and restoring the equipment to full working order. The abbot is the spirit behind the HS5AL club station at Doi Khamor, which is in a prime, quiet location, high-up and overlooking woods and ricefields and which counts several RAST life members who are active on HF as its members. These are experienced intermediate class amateur radio operators who have promised to help maintain the equipment that is over 30 years old and uses vacuum tubes. These include Kurt Klement, HS0ZIE, Barry Kirkwood, ZL1DD and Sheridon Street, HS0ZEE. Above the HS5AL clubhouse a mountain staircase of over 1,700 steps leads to source of the sacred spring water and also to the Lamphun club station's VHF repeater which is some 710 metres above sea level. Having participated in the handover and experienced the friendship and hospitality extended by the members of HS5AL, I think I can say that if there is indeed a "ham radio heaven" then this club station and its temple surroundings must come pretty close to it in an earthly representation -- and now that it has HF capabilities I am looking forward to working HS5AL on one of the HF bands soon. You will find a more complete story and additional photographs about the equipment handover which also included a donation over 60 amateur radio reference books by Malee Rose by following this link. The website flood.144mhz.net is providing three channels of live amateur radio traffic that are assisting flood relief efforts in the South. These channels are for Hat Yai, Trang and Surat Thani (channels 1, 2 and 3 respectively). The site also has continuously updating text messages from people discussing the flood disaster in Thailand on Twitter and using the tag #ThaiFlood. You can read these and listen to the repeater traffic, which is in Thai, at the above link. President of the Nakhon Ratchasima Amateur Radio Association Charnchai Sirimornpan (seated, centre left) is seen with other radio amateurs at the association's centre flood relief centre at the Provincial Hall. The banner reads: "Kindness from... radio amateurs". Amateur radio operators in the flood-stricken areas of Nakorn Ratchasima and Chaiyaphum are putting their communications talents and capabilities to good use, helping authorities with the Nakorn Ratchasima Amateur Radio Association having set up a co-ordinating centre using the callsign HS3AN. This station, located at the Provincial Hall in Korat, has been working closely with government agencies, relaying details about the emergency situation and explaining the problems being faced to relevant officials and relief workers so that action can be promptly taken. 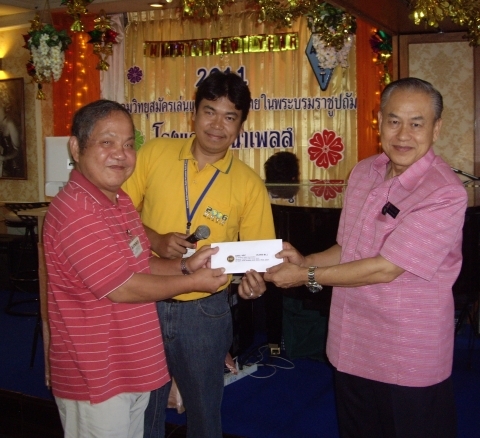 President of the Nakorn Ratchasima Amateur Radio Association Charnchai Siriamornpan who holds the callsign HS4XU related how radio amateurs had also pitched in with soldiers, rescue volunteers and workers from various foundations to help flood-stricken people by providing food and helping to ferry expectant mothers who were about to give birth to hospitals. Under the guidance of National Disaster Warning Centre Adviser Manas Songsaeng, HS1DE, the Nakorn Ratchsima Amateur Radio Association club station HS3AN has also been coordinating relief work with the help of other amateur radio communications centres based in Khao Yai, Phimai and in Chaiyaphum that were also providing information to people travelling to and from Nakhon Ratchasima. Amateur radio is a service that enables licensed individuals to communicate with one another using VHF and HF (short wave) radio communications that functions independently from cellular telephone networks and functions where mobile phone signals do not reach. There are over 100,000 such operators in Thailand. Deputy president of the association Prasit Thongjunteuk, HS3KNC, whose own ricefields that cover 10 rai have been totally destroyed by floodwaters, said he had resigned himself to this loss, and he is continuing to take the microphone to help with amateur radio communications around Korat. 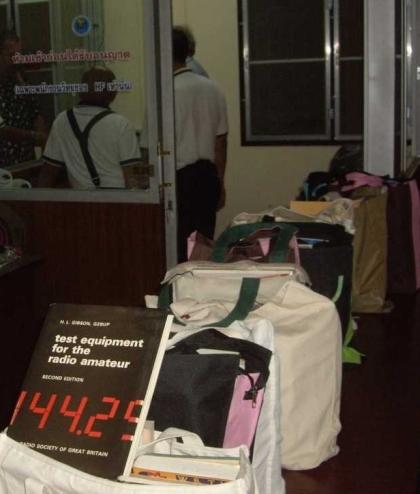 Charnchai added that all the work of these radio amateurs was voluntary and that these operators were using their own funds and resources, with emergency funds being provided by the Nakorn Ratchasima's Amateur Radio Association's committee. He also thanked 100 Watts Magazine and the Radio Amateur Society of Thailand under the royal patronage of His Majesty the King for their support. For an account in the Bangkok Post newspaper, please click on this link . 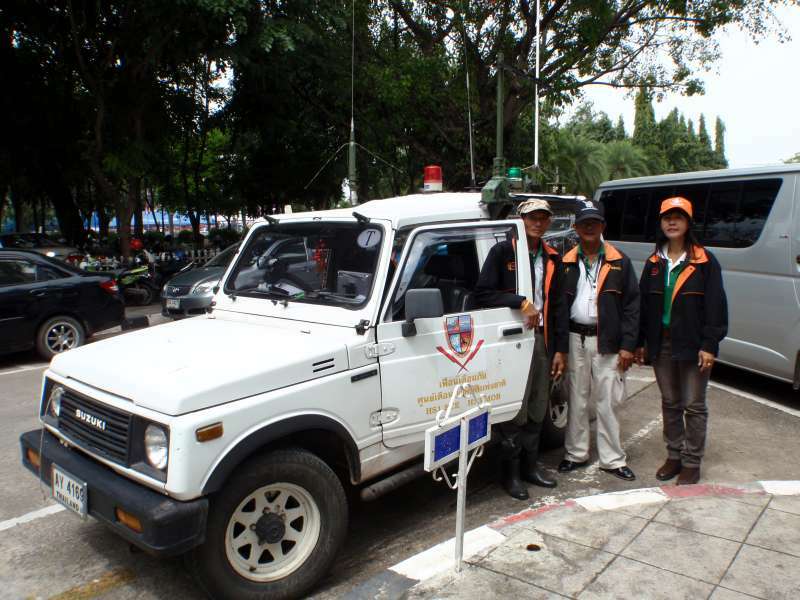 Members of the Nakhon Ratchasima Amateur Radio Association pose beside a vehicle of the National Disaster Warning Centre based in Korat has antennas for two-way amateur radio communications. There was a good turnout at the RAST meeting on October 3 at Sena Place Hotel. 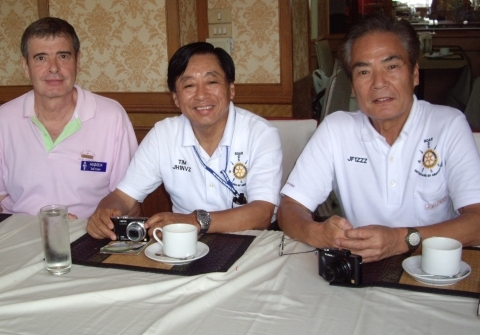 The October RAST meeting saw one newcomer, Remy, PA0SAN and one "returnee", Karl, DK1XH -- whose last RAST meeting had been one at the Erawan Hotel back in 1976, when he recalls meeting the then President, Gen Kamchai Chotikul, HS1WR-SK. 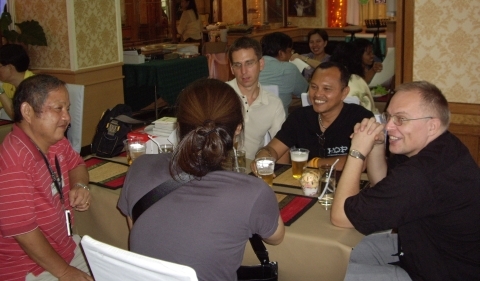 Since then, Karl has maintained close ties with Thailand, taking a Thai wife in 1980 whom he had met in Germany and returning here on holiday frequently, although he said he had never been in Bangkok when there was a RAST meeting -- until this one. 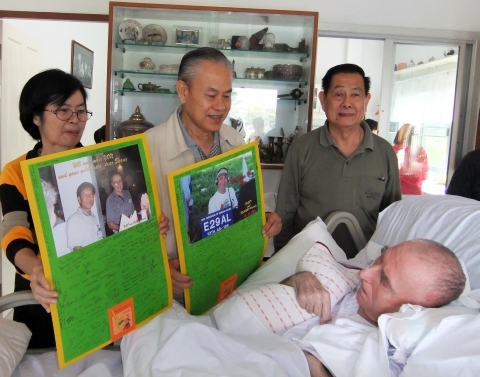 Introducing himself, he said that he was now looking forward to retirement in a couple of years and that he had applied for RAST life membership and that he would soon be seeking a Thai reciprocal licence. Speaking during the formal part of the October meeting at the Sena Place Hotel, RAST President Chaiyong Wongwuticomjon, HS1QVD, announced that he and two other committee members, Swen Roeder, HS0ZFZ and Winit Kongprasert, HS1CKC had visited Jamnong Saowana, HS1JN on September 14. 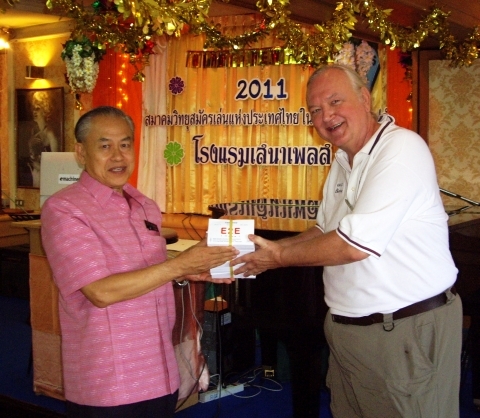 Jamnong, now in his eighties, is one of the pioneer hams in Thailand and had been active on the HF bands for over 50 years. He is a former vice president of RAST and served on almost every RAST committee from the mid-1970's until recently and Chaiyong said that they had found him in good health. The visit came after Jamnong had recovered from a bout in hospital, and Chaiyong went on to wish him well. 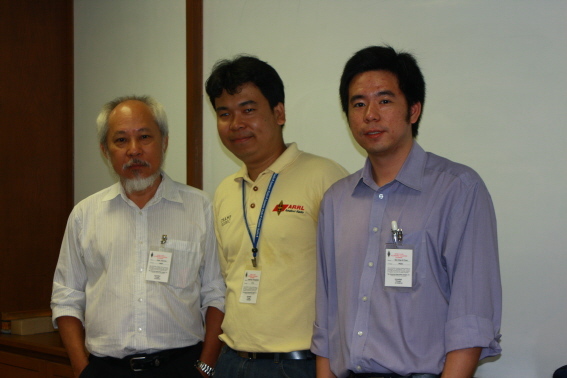 Following the National Telecommunications Commission's authorisation of the special callsign E2E for use by RAST in late July, a special committee led by Charles Harpole, HS0ZCW has drawn up guidelines for its allocation and use and these were reviewed and approved by the RAST committee, after being translated into Thai by Winit, HS1CKC. The guidelines, which outline to RAST members the details they need to provide in advance, can be found here and also in a link provided on the opening page in the "Links to resources" section at left. The committee meeting prior to the meeting approved a proposal made by Sam, HS0ZDY and Tony, HS0ZDX that a Yaesu FT101 transceiver that the late Edward Rose, HS0ZAN, has willed to RAST would, in turn, be donated by the society to HS5AL, a club station in Lamphun. Sam and Tony plan to travel north to Chiang Mai soon and inspect the late Ed Rose's equipment, make any necessary repairs and ensure that it is in good working condition, and then oversee its presentation to the club station in Lamphun on behalf of RAST. 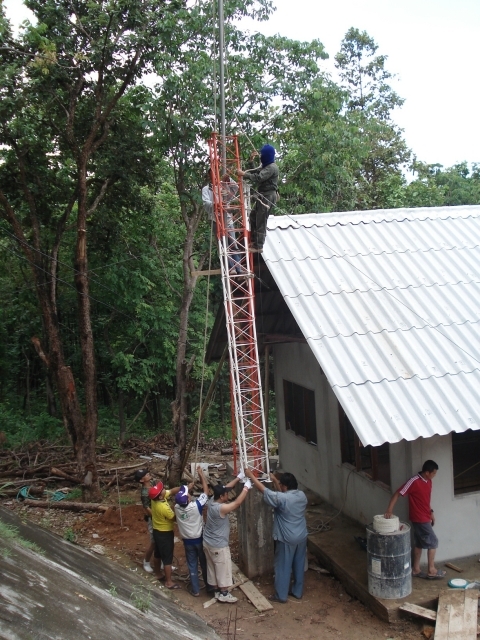 This club station, located at a religious centre, has several members living in Chiang Mai and Lamphun with intermediate class (HF) licences and a 60-metre tower and it is hoped this donation will enable the station to operate on HF soon. "Ham radio is more than you think"
This is the slogan for the Lampang Amateur Radio Technology 2010 conference to be held in Lampang this coming Saturday, October 6, led by Chalermpon (Champ) Muangamphun, E21EIC and which has other RAST representatives participating as speakers including Kamol Nakchum, E20EHQ and Winit, HS1CKC. RAST will also supply some free brochures in Thai that answer the question "What is amateur radio?" and will provide free stickers to participants. Chaiyong also announced that RAST would sponsor trophies to the value of 2,000 baht for winners of the Thailand Field Day Contest 2010, conducted over a 24-hour period on the weekend of February 6-7. Results have yet to be announced for this contest, managed by Champ, E21EIC. More information about the contest in Thai can be found here. HS0AC Station Manager Finn, OZ1HET, said that the RAST club station at the Asian Institute of Technology (AIT) had been active in the Scandinavian Activity Contest on the weekend of September 18-19, 2010, on CW, making 167 QSO's for a total of 11,470 points scored. Countries worked included Iceland and the Faroe Islands. The RAST committee has assigned Wacharaphol Wiengchai, HS4DDQ to prepare stickers and souvenirs, including badges, caps, polo shirts and other items for sale to members at meetings and at events where RAST representatives are participating. Other committee members are assisting him in the design of these fund-raising items. In the question-and-answer session at the end of the October meeting a member asked whether HF transceivers at HS0AC that were not being used might be rented out to members and Chaiyong replied by saying that this could indeed be done, and he asked Station Manager Finn to look into this possibility and work out the conditions under which such a rental might take place.